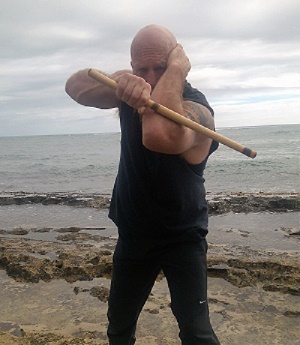 KI Fighting Concepts is more than a martial arts training source, more than a collection of fighting tools and teaching viewpoints. We pride ourselves on being the source of innovation in today's martial arts world--a wellspring of creativity that pushes this field past it's archaic status quo and away from the regurgitated and antiquated technologies of decades or perhaps centuries past. As in any field, our knowledge, no matter how steadfastly and diligently it is acquired, will ultimately stagnate without constant refining and "out of the box" thinking. Unless we embrace the mentality that expertise is an illusion and progressive learning is the only truth, we will ultimately become dinosaurs, doomed to extinction. In my timeline, I have had frequent conflicted interfaces with some of the "masters" of various disciplines--not because I was resistant to training or disrespectful, but rather because I was resistant to knowing. Let me explain. Since childhood, I was always the student who questioned the dominant paradigms that were accepted by mainstream culture. Being a contrarian, I embraced curiosity over confirmation, sought creativity over acumen, and above all, I wanted to understand. This means I wanted my teachers to lead me in that process of discovery, but so often they were unable or unwilling to take on that role because it meant relinquishing the status of "expert" and embracing the status of student themselves. As much as I have always had the most profound deference toward anyone I learned from, I have been forced out of systems time and time again because there was an inherent frustrated collision between my path and the prevalent and popular course. Although these experiences were deeply painful at the time (and still mark my heart with scar tissue), I have learned to accept that these contentions are part and parcel to the course of innovation. Trendsetting is a way of thinking, it is a lifestyle, never a final endpoint. Once the trend is "set", then one stops being a trendsetter, as the trend is always evolving. As many of you have seen in our online library, the material we continuously produce spans decades and reflects a tenacious commitment to the genesis of novel and improved perspectives. I built my first wooden dummy in 1982, and in 1993 I created the Slam Set, which at that time consisted of 108 movements. To reflect my ongoing course of system improvement, the Slam Set currently contains 180 movements, and is endlessly developing. I knew when I created this system that it was about 90% complete and today I can say that it is...90% complete. Such is the process of unfolding refinement, and it will be 90% complete on the day I die. I ceaselessly take out that which is non-essential and add that which is more expedient. My process is reducing complexity, both simplifying and expanding the system simultaneously. That is ultimately the trend I want to set with KI Fighting Concepts--an interminable pursuit of that which is more essential, more concise and also more expansive at the same time. I call this "simplexity". The trend we set is not just in our systems of martial arts, it is also in the type of martial artist that we seek to cultivate. I want all my students to learn not just WHAT to think, but HOW to think. Leo Tolstoy writes in "War and Peace" about the broader systems that yield the outcomes of history. It is a common tendency to attribute the happenings of our world to individuals--great leaders, dictators and tyrants alike. However, when one adopts a more enlightened and macroscopic lens, we can see that events emerge due to systems, not individuals. As martial artists, we look at our achievements and ultimately our fighting capabilities as being the result of idiosyncratic characteristics, without considering the broader systems under which we operate. If these systems are flawed, outdated, ineffective or limited in scope, then the potency of any one pupil will be confined to those same parameters. Trendsetting means expanding the potential of the paradigms under which we operate. KI Fighting Concepts is a broadening and distilling force and we intend to both widen and streamline the latitude of the martial arts world, so that you can achieve maximum impact potential. To date, we have over 400,000 people following our martial arts movement. By reading our blogs, watching our clips and engaging in peer discussions, you are hopefully expanding your horizons as a fighter and a thinker. However, to fully benefit from our philosophy and methodologies, you must immerse beyond the onlooking stage and become a fully-engaged student of our methods and methodologies. Sign up for the online library today so that you can attain the velocity worthy of your potential. Click here to learn more about our KI Online Library.